The Washington Nationals introduced new field manager Dave Martinez Thursday, the club's seventh skipper and fourth since the 2013 season. 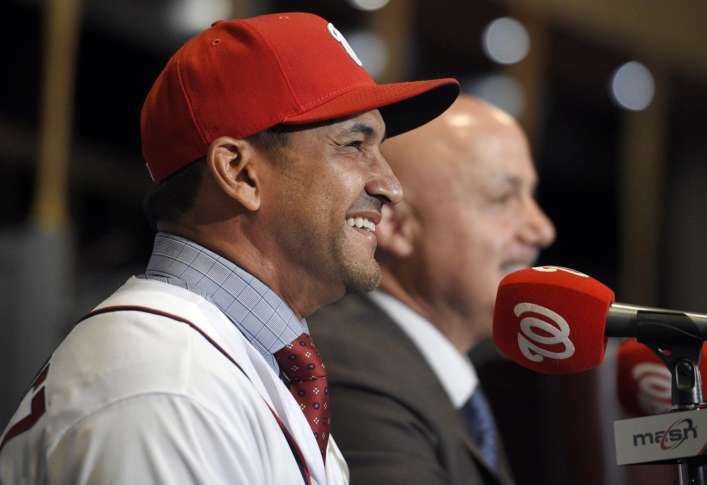 WASHINGTON — The Washington Nationals introduced new manager Dave Martinez in a news conference Thursday afternoon, roughly 12 hours after the 2017 baseball season came to a close. Martinez, who was officially announced as the successor to Dusty Baker on Monday, signed a three-year deal with an option for a fourth season. Martinez, 53, has spent the last 10 seasons as a coach under Joe Maddon, both with the Tampa Bay Rays and Chicago Cubs. He also played 16 seasons of Major League ball as an outfielder and first baseman for nine different clubs. Martinez actually played for Dusty Baker in San Francisco in 1993-94 and Bobby Cox at the end of his career. Martinez becomes the club’s seventh manager in the 14 years since the franchise moved from Montreal, and the fourth since 2013. He will wear the number 4. Nationals General Manager Mike Rizzo called Martinez “a creative, analytically minded person,” a point he stressed when announcing the hire earlier in the week. The Nationals interviewed Martinez four years ago for the position, but ultimately went with Matt Williams, who Rizzo had personal connections with going back to their time together in Arizona. Rizzo said Martinez was much more prepared for the position now, having won a championship with the Cubs last year. One of Martinez’s primary challenges will be quickly gaining the trust of a veteran clubhouse. To that end, he said he is flying to Arizona this weekend for a Max Scherzer charity event. “I can’t wait to talk to all of them and pick their brains and see where we can improve,” said Martinez, who said he spoke with reliever Sean Doolittle for about 15 minutes on Thursday. Martinez, who is bilingual, took questions in both English and Spanish during the news conference. The Nationals have a few native Spanish speakers on the team, notably top prospect Victor Robles.